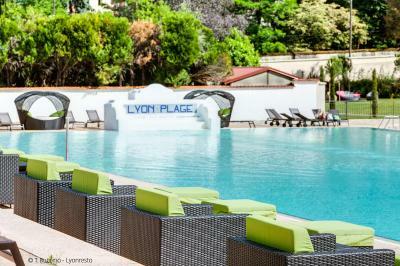 Lock in a great price for Hôtel Lyon Métropole – rated 8.5 by recent guests! The spa and the pool facilities were outstanding, the massage was excellent. They did lose my reservation for the massage, but it was compensated free of charge! Can't complain about that, and it was still served on time. They have such a variety of options as well, it's quite impressive. I also really enjoyed the bar and the restaurant, 5 stars on those. I had no trouble ordering, they excused my poor French and everyone I talked to had no trouble communicating with me in English. 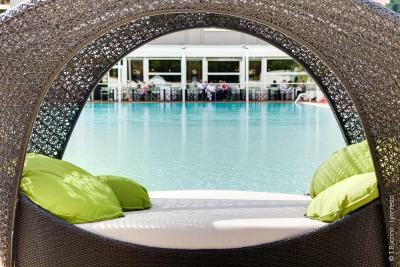 Great relaxation spot, superb spa facilities. Very nice staff. The staff was extremely helpful. I believe the young woman’s name was Melissa. Melissa graciously called Viking Ship Co. ro find what Quai our cruise ship would be docked. 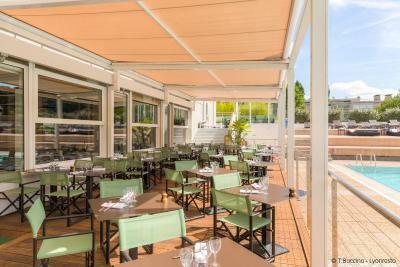 In general, it is a nice lux hotel with nice spa, located on the river. Free parking, nice view, even Tesla car chargers. 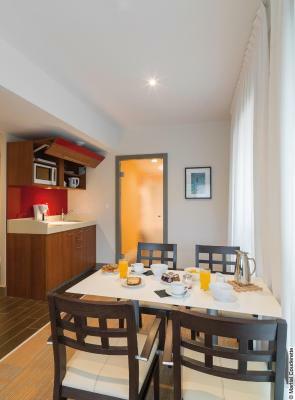 Very good leisure facilities and good location for bus into the centre of town. Most amazing outdoor pool! Excellent breakfast. Friendly staff. Comfortable room. 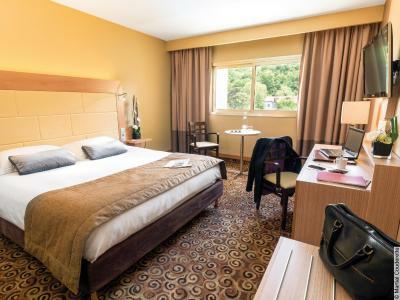 One of our top picks in Lyon.Hôtel Lyon Métropole offers a 8202 feet² well-being area providing guests free access to an indoor and Olympic-size seasonal outdoor swimming pool and a spa with a hammam, saunas, hot tub and fitness center. Free WiFi is available throughout the property. 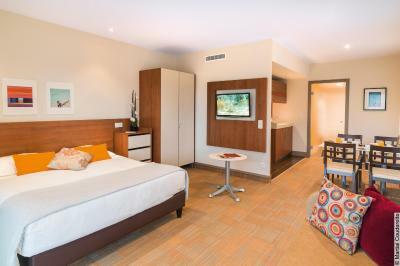 The rooms and apartments have a flat-screen TV with Canal+ and beIn Sports channels. 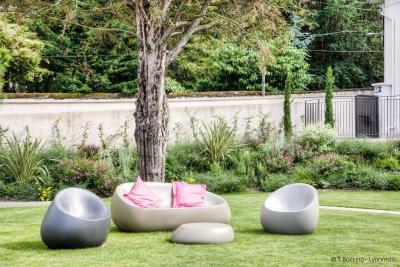 Some units have a seating area. 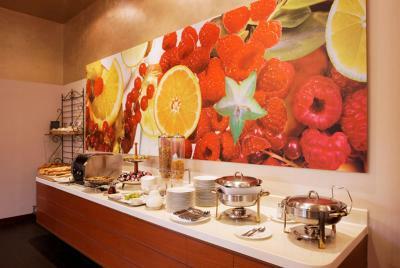 A buffet breakfast is served every morning at Hôtel Lyon Métropole. 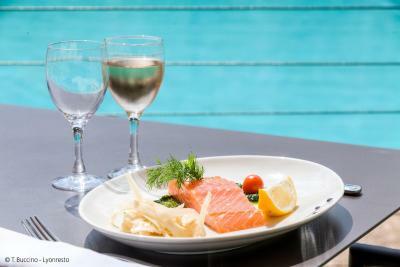 French specialties and homemade meals are offered in the restaurant or by the swimming pool on the terrace. The bar is open every day and has a cocktail menu. Guests can play tennis on the 4 tennis courts and visit the onsite hair salon. Upon reservation and for an extra charge, guests can enjoy treatments in the spa's beauty salon. The hotel reception is open 24 hours a day. 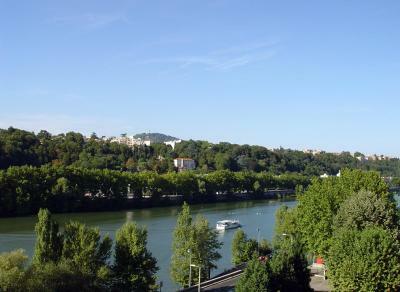 Lyon City Center is 1.9 mi from the hotel. Public parking is available on site and Cuire Metro Station is a 20-minute walk away. Bus number 40 stops in front of the hotel and offers direct access to the city center in 10 minutes. A public bike rental station is available just opposite the Hôtel Lyon Métropole. Charging stations for electric cars are available at this property. 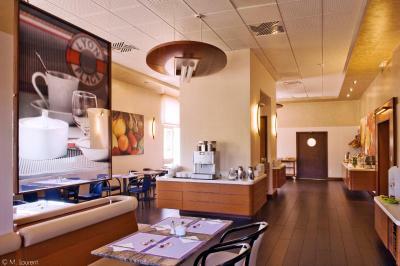 When would you like to stay at Hôtel Lyon Métropole? This room offers Canal+ satellite channel. The comfort rooms cannot accommodate an extra bed. Free access to the spa and both swimming pools is included. This apartment has 1 bedroom and includes a seating area with a sofa bed. There are 2 LCD TVs with Canal+ channel. Free access to the spa and both swimming pools is included. 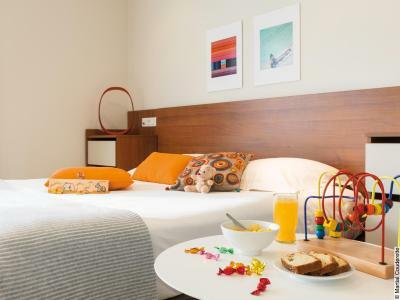 This apartment can accommodate 2 adults and 2 children under 12 years of age. 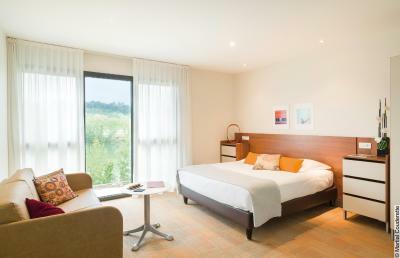 Featuring a seating area, this room offer views of the swimming pool or the river and a complimentary coffee machine. There is a flat-screen TV with Canal+ channel. Free access to the spa and both swimming pools is included. 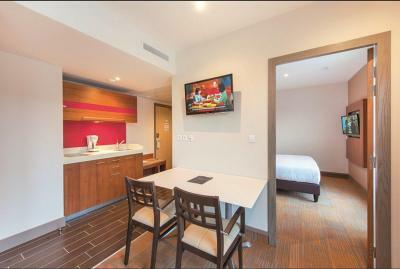 This air-conditioned studio has a flat-screen TV with Canal+, a fully equipped kitchenette with a stovetop and coffee machine, and a bathroom with a bath and shower. 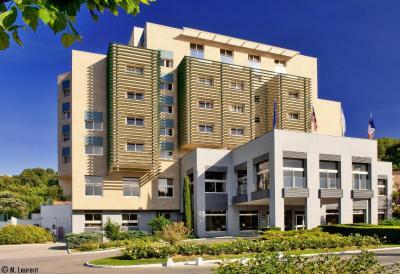 Hotel Lyon Metropole Resort, Residence & Spa, your 4 star hotel in Lyon ! 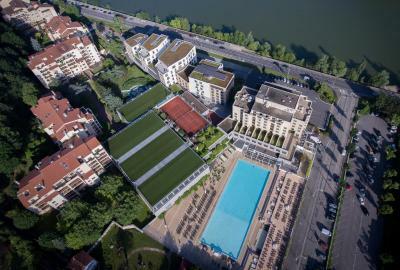 Located on the banks of the Saône, in a green setting in the 4th arrondissement of Lyon, the Hotel Lyon Métropole Resort, Residence & Spa welcomes you for a city break, a business trip or for leisure... 174 rooms, studios & apartements (2 or 3 rooms), one of the biggest City Spa of France but also the "Brasserie Lyon Plage" where you can taste delicious meals at lunch or dinner. With a view over the olympic swimming-pool, the Bar of the hotel is the perfect place for your business appointments or for any moments of relaxation. 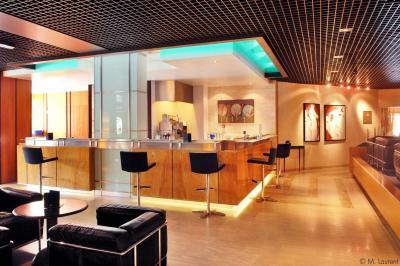 For all your business events, 1 000 square meter are at your disposal. House Rules Hôtel Lyon Métropole takes special requests – add in the next step! 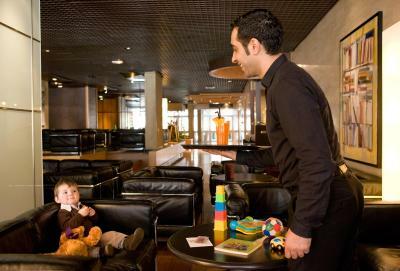 Hôtel Lyon Métropole accepts these cards and reserves the right to temporarily hold an amount prior to arrival. Guest staying in the guest rooms have free access to the spa and both swimming pools from 15:00 on their day of arrival until 12:00 on their day of departure. Guests are kindly requested to reserve beauty treatments in advance. Please note that the outdoor pool is open from mid-May to mid-September yearly. Please note that the covered secured parking is at an additional charge and outdoor parking is available free of charge. Pets are welcome for an additional fee of EUR 15 per pet, per day. Please note that the city tax is always paid directly at the hotel on site. 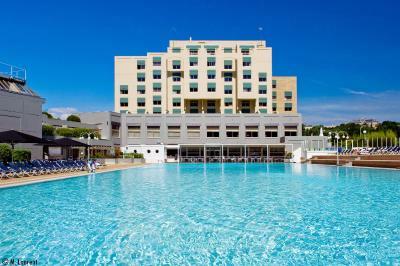 Please note that the indoor swimming pool and the outdoor hydromassages' facilities will be closed from 03 to 07 June 2019, inclusive. The saunas, hammam and sports facilities will remain open during this period of time. Smell in the bathroom. Also, children shorter than 140 cm (so nearly all children) were not allowed in the outside pool/spa area. We were not aware of this when we booked. The breakfast was not great, I scored it perfectly but as an American it wasn't to my liking. The room service was wonderful, I loved that but the bacon was raw, and the sausage was cold. Also no milk for the cereal, only cottage cheese. However I don't think they deserve bad marks for my personal tastes. It was traditionally French. Not a perfect neighbourhood for strolling, but near enough to reach Lyon center by UBER for EUR10. Technically perfect for star hotel, brand new property. After travelling all day, I was greeted by the pleasant reception staff, it was a pleasure to relax in the exceptionally clean room. Excellent value for money. The bed was superb and I had good sleep, wakening refreshed and ready for the next part of my long journey home to Spain. room OK, bed OK, sport facilities very good ! There should be a lamp with much gentle light next to the bed, so that people can read before sleep. The light right now is too shiny. The room is comfortable, spacious and bright. I love it! Clean comfortable good amenities very good helpful staff. The spar was well run and excellent. On the expensive side, but in the end well worth it. Very poor wifi in the room. Could not use What's App to make calls overseas due to poor wifi ... even near the reception area !